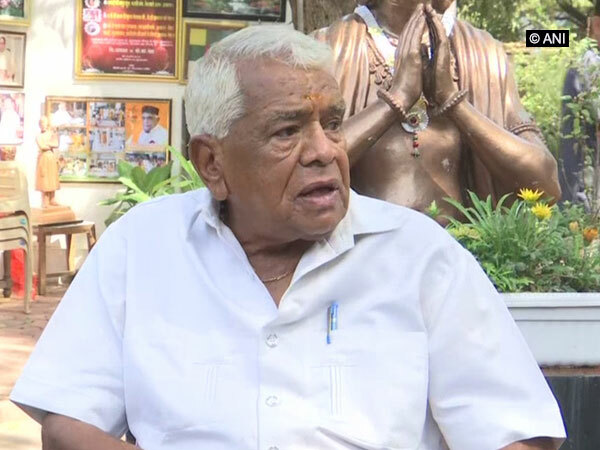 Bhopal (Madhya Pradesh) [India], Apr 5 (ANI): Endorsing Bharatiya Janata Party (BJP) veteran LK Advani's blog post, former chief minister of Madhya Pradesh, Babulal Gaur, said the BJP has never indulged in branding anyone as anti-national and that the Opposition in India has always been respected. "Mr Advani has said the right thing. We were in Opposition once, nobody called us anti-national then, neither have we done something like this. Atal Bihari Vajpayee ji even called Indira Gandhi 'Durga'. We need to think. There will always be an Opposition in a democracy. Even people who speak against the country cannot be called anti-national. We can only call such people deluded," Gaur told reporters. LK Advani, who broke his silence yesterday and came out in support of his party through a blog, has made quite a buzz on micro-blogging site Twitter. Advani’s take on nationalism is ever since trending on the social media site. Advani in his blog, titled “Nation First, Party Next, Self Last”, on Thursday asserted that the BJP had “never regarded those who disagree with us politically as enemies, but only as our adversaries” and that the BJP’s conception of Indian nationalism never regarded those who disagreed with it politically as “anti-national”. Prime Minister Modi also endorsed Advani's post by saying he summed up the true essence of the party and also tweeted the 91-year-old leader's blog.